If I know that my HashMap will fill up to contain, say, 100 objects, and will spend most of the time having 100 objects, I'm guessing that the optimal values are initial capacity 100 and load factor 1? Or do I need capacity 101, or are there any other gotchas? Curiously, capacity, capacity+1, capacity+2, capacity-1 and even capacity-10 all yield exactly the same results. I would expect at least capacity-1 and capacity-10 to give worse results. Using initial capacity (as opposed to using default value of 16) gives noticable put() improvement - up to 30% faster. Using load factor of 1 gives equal performance for small number of objects, and better performance for larger number of objects (>100000). However, this does not improve proportionally to the number of objects; I suspect there is additional factor that affects the results. get() performance is a bit different for different number of objects/capacity, but though it might slightly vary from case to case, generally it's not affected by initial capacity or load factor. EDIT2: Adding some charts on my part as well. Here's the one illustrating difference between load factor 0.75 and 1, in cases where I initialize HashMap and fill it up to full capacity. 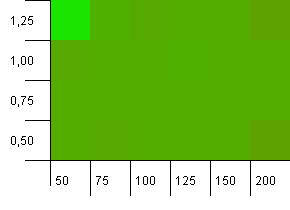 On y scale is time in ms (lower is better), and x scale is size (number of objects). Since size changes linearly, the time required grows linearly as well. So, let's see what I got. 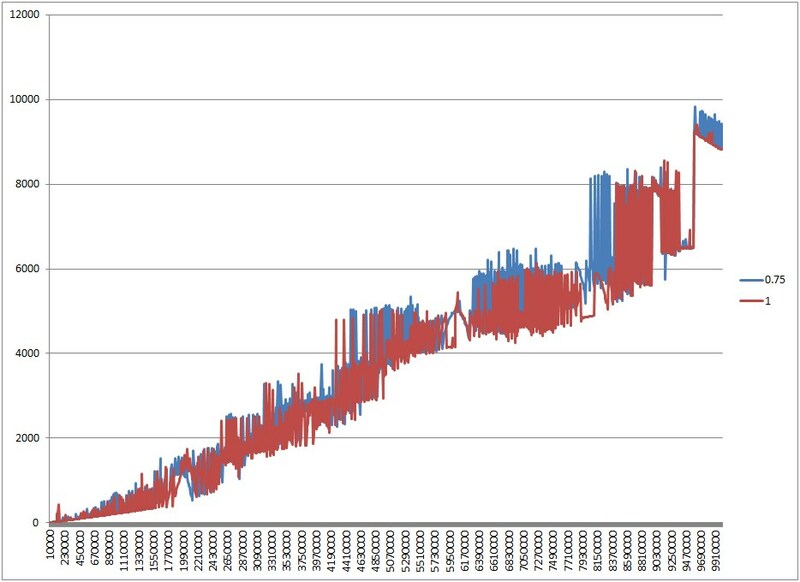 The following two charts show the difference in load factors. 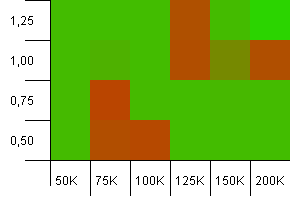 First chart shows what happens when HashMap is filled to capacity; load factor 0.75 performs worse because of resizing. However, it's not consistently worse, and there are all sorts of bumps and hops - I guess that GC has a major play in this. Load factor 1.25 performs the same as 1, so it's not included in the chart. 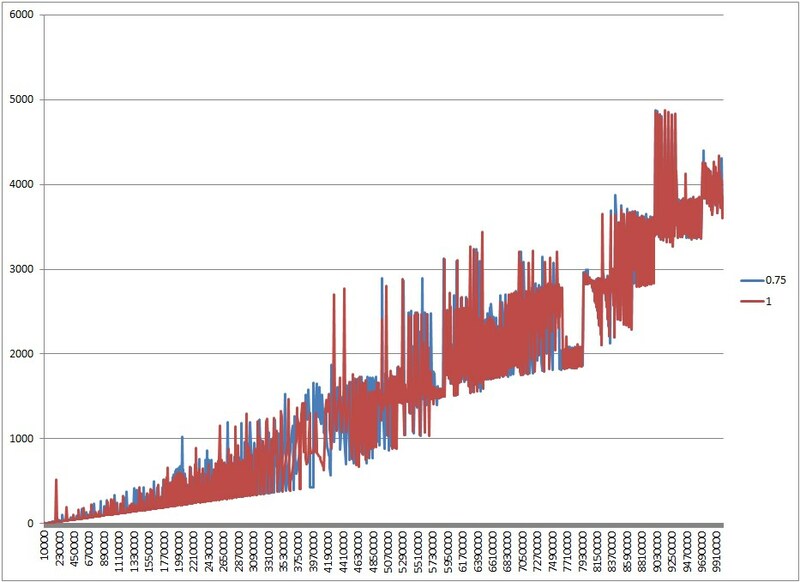 This chart proves that 0.75 was worse due to resizing; if we fill the HashMap to half capacity, 0.75 is not worse, just... different (and it should use less memory and have unnoticably better iteration performance). One more thing I want to show. 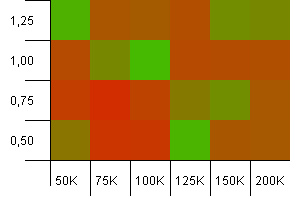 This is get performance for all three load factors and different HashMap sizes. Consistently constant with a little variation, except for one spike for load factor 1. I'd really want to know what that is (probably GC, but who knows). A number of different collection sizes have been tried: one hundred, one thousand and one hundred thousand entries. The keys used are instances of a class that are uniquely identified by an ID. Each test uses unique keys, with incrementing integers as IDs. The equals method only uses the ID, so no key mapping overwrites another one. The keys get a hash code that consists of the module remainder of their ID against some preset number. We'll call that number the hash limit. This allowed me to control the number of hash collisions that would be expected. For example, if our collection size is 100, we'll have keys with IDs ranging from 0 to 99. If the hash limit is 100, every key will have a unique hash code. If the hash limit is 50, key 0 will have the same hash code as key 50, 1 will have the same hash code as 51 etc. In other words, the expected number of hash collisions per key is the collection size divided by the hash limit. For each combination of collection size and hash limit, I've run the test using hash maps initialized with different settings. These settings are the load factor, and an initial capacity that is expressed as a factor of the collection setting. For example, a test with a collection size of 100 and an initial capacity factor of 1.25 will initialize a hash map with an initial capacity of 125. The value for each key is simply a new Object. Each test result is encapsulated in an instance of a Result class. At the end of all tests, the results are ordered from worst overall performance to best. The average time for puts and gets is calculated per 10 puts/gets. All test combinations are run once to eliminate JIT compilation influence. After that, the tests are run for actual results. + ", an initial capacity of " + initialCapacity + ", a load factor of "
//Generating our sample key collection. //Haha, what kind of noob explicitly calls for garbage collection? System.out.println("" + averagePutTime + " ns per 10 puts, "
+ averageGetTime + " ns per 10 gets, for a load factor of "
Running this might take a while. The results are printed out on standard out. You might notice I've commented out a line. That line calls a visualizer that outputs visual representations of the results to png files. The class for this is given below. If you wish to run it, uncomment the appropriate line in the code above. Be warned: the visualizer class assumes you're running on Windows and will create folders and files in C:\temp. When running on another platform, adjust this. Tests are divided first by collection size, then by hash limit. For each test, there's an output image regarding the average put time (per 10 puts) and the average get time (per 10 gets). The images are two-dimensional "heat maps" that show a color per combination of initial capacity and load factor. The colours in the images are based on the average time on a normalized scale from best to worst result, ranging from saturated green to saturated red. 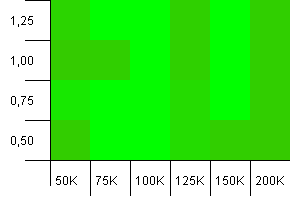 In other words, the best time will be fully green, while the worst time will be fully red. Two different time measurements should never have the same colour. 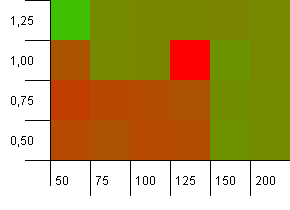 The colour maps are calculated separately for puts and gets, but encompass all tests for their respective categories. 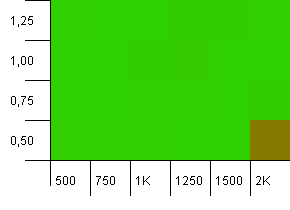 The visualizations show the initial capacity on their x axis, and the load factor on the y axis. Without further ado, let's take a look at the results. I'll start with the results for puts. Collection size: 100. Hash limit: 50. This means each hash code should occur twice and every other key collides in the hash map. Well, that doesn't start off very good. We see that there's a big hotspot for an initial capacity 25% above the collection size, with a load factor of 1. The lower left corner doesn't perform too well. Collection size: 100. Hash limit: 90. One in ten keys has a duplicate hash code. This is a slightly more realistic scenario, not having a perfect hash function but still 10% overload. The hotspot is gone, but the combination of a low initial capacity with a low load factor obviously doesn't work. Collection size: 100. Hash limit: 100. Each key as its own unique hash code. No collisions expected if there are enough buckets. An initial capacity of 100 with a load factor of 1 seems fine. Surprisingly, a higher initial capacity with a lower load factor isn't necessarily good. Collection size: 1000. Hash limit: 500. It's getting more serious here, with 1000 entries. Just like in the first test, there's a hash overload of 2 to 1. The lower left corner is still not doing well. But there seems to be a symmetry between the combo of lower initial count/high load factor and higher initial count/low load factor. Collection size: 1000. Hash limit: 900. This means one in ten hash codes will occur twice. Reasonable scenario regarding collisions. There's something very funny going on with the unlikely combo of an initial capacity that's too low with a load factor above 1, which is rather counter-intuitive. Otherwise, still quite symmetrical. Collection size: 1000. Hash limit: 990. Some collisions, but only a few. Quite realistic in this respect. We've got a nice symmetry here. Lower left corner is still sub-optimal, but the combos 1000 init capacity/1.0 load factor versus 1250 init capacity/0.75 load factor are at the same level. Collection size: 1000. Hash limit: 1000. No duplicate hash codes, but now with a sample size of 1000. Not much to be said here. The combination of a higher initial capacity with a load factor of 0.75 seems to slightly outperform the combination of 1000 initial capacity with a load factor of 1. Collection size: 100_000. Hash limit: 10_000. Alright, it's getting serious now, with a sample size of one hundred thousand and 100 hash code duplicates per key. Yikes! I think we found our lower spectrum. An init capacity of exactly the collection size with a load factor of 1 is doing really well here, but other than that it's all over the shop. Collection size: 100_000. Hash limit: 90_000. A bit more realistic than the previous test, here we've got a 10% overload in hash codes. The lower left corner is still undesirable. Higher initial capacities work best. Collection size: 100_000. Hash limit: 99_000. Good scenario, this. A large collection with a 1% hash code overload. Using the exact collection size as init capacity with a load factor of 1 wins out here! Slightly larger init capacities work quite well, though. Collection size: 100_000. Hash limit: 100_000. The big one. Largest collection with a perfect hash function. Some surprising stuff here. An initial capacity with 50% additional room at a load factor of 1 wins. Alright, that's it for the puts. Now, we'll check the gets. Remember, the below maps are all relative to best/worst get times, the put times are no longer taken into account. Collection size: 100. Hash limit: 50. This means each hash code should occur twice and every other key was expected to collide in the hash map. Whoa Nelly! This is the most likely scenario to correlate with the asker's question, and apparently an initial capacity of 100 with a load factor of 1 is one of the worst things here! I swear I didn't fake this. Collection size: 100. Hash limit: 100. Each key as its own unique hash code. No collisions expected. This looks a bit more peaceful. Mostly the same results across the board. Collection size: 1000. Hash limit: 500. Just like in the first test, there's a hash overload of 2 to 1, but now with a lot more entries. Looks like any setting will yield a decent result here. And just like with the puts for this setup, we get an anomaly in a strange spot. Decent performance everywhere, save for the combination of a high initial capacity with a low load factor. I'd expect this for the puts, since two hash map resizes might be expected. But why on the gets? A wholly unspectacular visualization. This seems to work no matter what. Collection size: 100_000. Hash limit: 10_000. 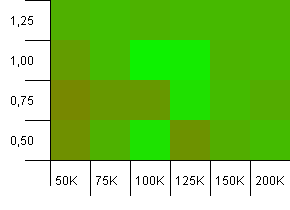 Going into the 100K again, with a whole lot of hash code overlap. It doesn't look pretty, although the bad spots are very localized. Performance here seems to depend largely on a certain synergy between settings. 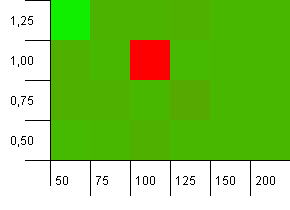 Much variance, although if you squint you can see an arrow pointing to the upper right corner. Very chaotic. It's hard to find much structure here. Anyone else thinks this is starting to look like Atari graphics? This seems to favour an initial capacity of exactly the collection size, -25% or +50%. Regarding put times: you'll wish to avoid initial capacities that are lower than the expected number of map entries. If an exact number is known beforehand, that number or something slightly above it seems to work best. 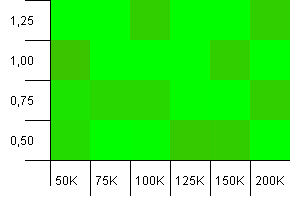 High load factors can offset lower initial capacities due to earlier hash map resizes. For higher initial capacities, they don't seem to matter that much. Regarding get times: results are slightly chaotic here. There's not much to conclude. It seems to rely very much on subtle ratios between hash code overlap, initial capacity and load factor, with some supposedly bad setups performing well and good setups performing awfully. I'm apparently full of crap when it comes to assumptions about Java performance. The truth is, unless you are perfectly tuning your settings to the implementation of HashMap, the results are going to be all over the place. If there's one thing to take away from this, it's that the default initial size of 16 is a bit dumb for anything but the smallest maps, so use a constructor that sets the initial size if you have any sort of idea about what order of size it's going to be. We're measuring in nanoseconds here. The best average time per 10 puts was 1179 ns and the worst 5105 ns on my machine. The best average time per 10 gets was 547 ns and the worst 3484 ns. That may be a factor 6 difference, but we're talking less than a millisecond. On collections that are vastly larger than what the original poster had in mind. Well, that's it. I hope my code doesn't have some horrendous oversight that invalidates everything I've posted here. This has been fun, and I've learned that in the end you may just as well rely on Java to do its job than to expect much difference from tiny optimizations. That is not to say that some stuff shouldn't be avoided, but then we're mostly talking about constructing lengthy Strings in for loops, using the wrong datastructures and making O(n^3) algorithsm. The source code jumps initial capacity the next highest power-of-two internally. That means that, for example, initial capacities of 513, 600, 700, 800, 900, 1000, and 1024 will all use the same initial capacity (1024). This doesn't invalidate the testing done by @G_H though, one should realize that this is being done before analyzing his results. And it does explain the odd behavior of some of the tests. Just go with 101. I'm not actually sure that it's needed, but it couldn't possibly be worth the effort to ever bother finding out for sure. EDIT: Some justification for my answer. First, I'm assuming that your HashMap will not grow beyond 100; if it does, you should leave the load-factor as it is. Similarly, if your concern is performance, leave the load-factor as is. If your concern is memory, you can save some by setting the static size. This might maybe be worth doing if you're cramming a lot of stuff in memory; i.e., are storing many maps, or creating heap-space-stressing-sized maps. Second, I choose the value 101 because it offers better readability... if I'm looking at your code afterwards and see that you've set the initial capacity to 100 and you're loading it with 100 elements, I'm going to have to read through the Javadoc to make sure that it won't resize when it reaches precisely 100. Of course, I won't find the answer there, so I'll have to look at the source. This is not worth it... just leave it 101 and everyone is happy and no-one is looking though the source-code of java.util.HashMap. Hoorah. Third, the claim that setting the HashMap to the exact capacity of what you expect with a load factor of 1 "will kill your lookup and insertion performance" is just not true, even if it's made in bold. ...if you have n buckets, and you randomly assign n items into n buckets, yep, you're going to end up with items in the same bucket, sure... but that's not the end of the world... in practice, it's just a couple more equals comparisons. In fact, there's esp. little difference when you consider that the alternative is assigning n items into n/0.75 buckets. Norm put:78 ms. Static put:78 ms. Dynamic put:62 ms. Norm put:764 ms. Static put:763 ms. Dynamic put:748 ms. Norm put:12921 ms. Static put:12889 ms. Dynamic put:12873 ms. Norm get (hits):47 ms. Static get (hits):31 ms. Dynamic get (hits):32 ms. Norm get (hits):327 ms. Static get (hits):328 ms. Dynamic get (hits):343 ms. Norm get (hits):3304 ms. Static get (hits):3366 ms. Dynamic get (hits):3413 ms. Norm get (rand):63 ms. Static get (rand):46 ms. Dynamic get (rand):47 ms. Norm get (rand):483 ms. Static get (rand):499 ms. Dynamic get (rand):483 ms. Norm get (rand):5190 ms. Static get (rand):5362 ms. Dynamic get (rand):5236 ms.
re: ↑ — there's about this →||← much difference between the different settings. With respect to my original answer (the bit above the first horizontal line), it was deliberately glib because in most cases, this type of micro-optimising is not good. So if you're expecting 100 entries, perhaps a load factor of 0.75 and an initial capacity of ceiling(100/0.75) would be best. That comes down to 134. I have to admit, I'm not certain why lookup cost would be greater for a higher load factor. Just because the HashMap is more "crowded" doesn't mean that more objects will be placed in the same bucket, right? That only depends on their hash code, if I'm not mistaken. So assuming a decent hash code spread, shouldn't most cases still be O(1) regardless of load factor? EDIT: I should read more before posting... Of course the hash code cannot directly map to some internal index. It must be reduced to a value that fits the current capacity. Meaning that the greater your initial capacity, the smaller you can expect the number of hash collisions to be. Choosing an initial capacity exactly the size (or +1) of your object set with a load factor of 1 will indeed make sure that your map is never resized. However, it will kill your lookup and insertion performance. A resize is still relatively quick and would only occur maybe once, while lookups are done on pretty much any relevant work with the map. As a result, optimizing for quick lookups is what you really want here. You can combine that with never having to resize by doing as the JavaDoc says: take your required capacity, divide by an optimal load factor (e.g. 0.75) and use that as the initial capacity, with that load factor. Add 1 to make sure rounding doesn't get you. Why is the default fill ratio of HashSet Constructor 0.75? 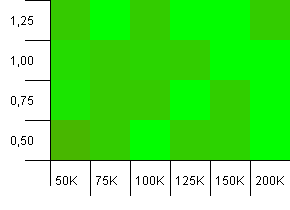 Should you define initial capacity and load factor of a HashMap, if the number of elements is known in advance? 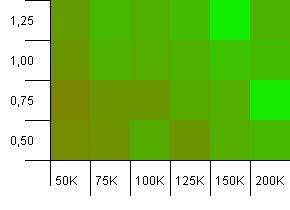 Should a custom Java HashMap size be used? How to test(Do memory analysis) different load factors of a concurrent hashmap? What is the difference between the HashMap and Map objects in Java? What is the significance of load factor in HashMap? What the iteration cost on a HashSet also depend on the capacity of backing map? What is meant by number of buckets in the HashMap? Impact of load factor on lookup time? HashSet initial capacity argument means number of buckets or number elements I expect to store?